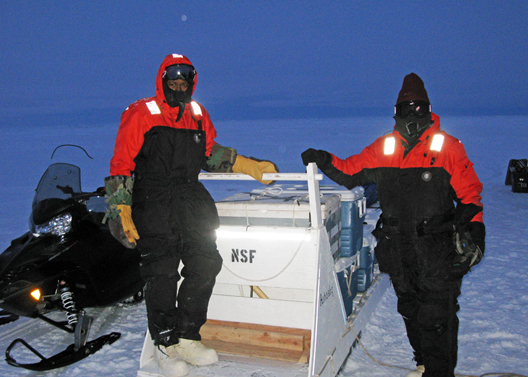 Skidaway Institute of Oceanography researchers Aron Stubbins and Marc Frischer have been awarded a research grant from the National Science Foundation for $224,037 to study the origins of organic carbon in glaciers. Stubbins and Frischer are part of an international team working on the two-year project. Glaciers and ice sheets represent the second largest reservoir of water in the global hydrologic system. 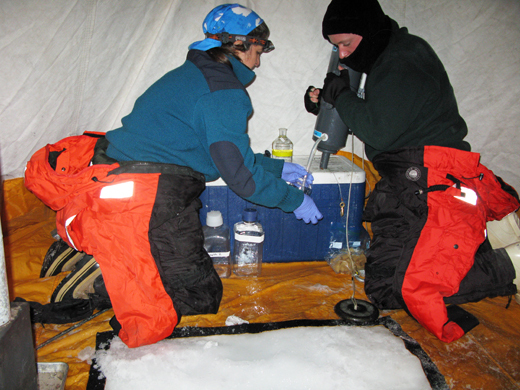 Although, the carbon contained in the glacial ice is a major contributor to the downstream ecosystems, the dynamics of glacial biogeochemistry are poorly understood. Much of the carbon has been thought to have come from ancient peat lands and forests overrun by the glaciers. 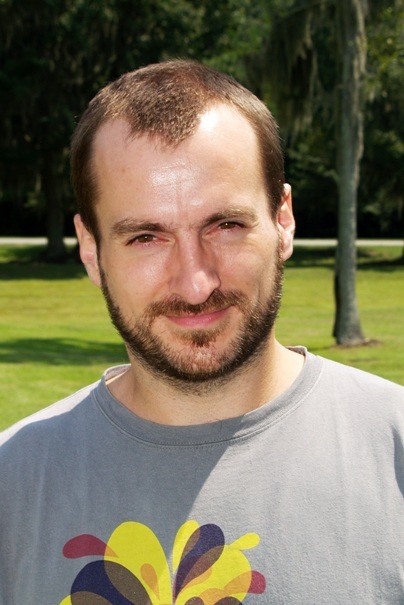 However, recent research by Stubbins and his colleagues challenges that explanation. They hypothesize that the main source is atmospheric carbon from the combustion of fossil fuels and biomass. The proposed work will determine the extent to which fossil fuels contribute to the dissolved organic material (DOM) in the glaciers. They will verify the age and stability of the glacial DOM and quantify the extent to which it is being exported to downstream ecosystems. 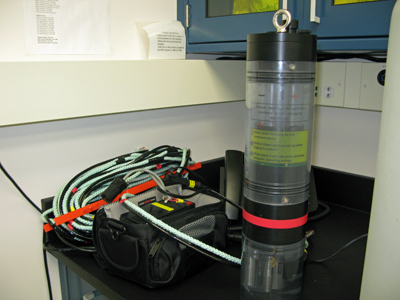 Stubbins and Frischer will be working with other scientists, including Robert Spencer, Woods Hole Research Center; Eran Hood, University of Alaska Southeast; Peter A. Raymond, Yale University; Greg Kok, Droplet Measurement Technologies; and Thorsten Dittmar, Max Planck Group for Marine Geochemistry, Oldenburg, Germany. Well fed and rested we were ready for another day on the ice. Because of all the uncertainty surrounding the ice conditions we are all trying to make the most of the opportunities we get. Today, in addition to collecting our normal samples, the Bronk team (Stephen and Rachel) are planning to stay a bit longer to collect ice cores and Niko is going to attempt to collect samples for his methane studies. It’s a lot to do and necessitated rather intricate planning, so that we always have enough snow machines, sleds, drivers, guides, and bear guards. Everything started smoothly. We all set out about 11:00 as the dawn twilight began (still no sun, but some light) and headed north. 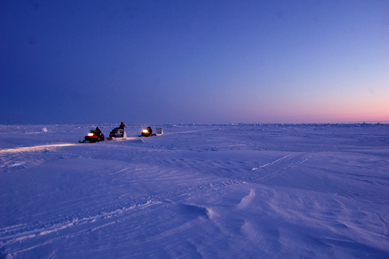 First, we headed north over the frozen tundra and then out onto the ocean. The ice at our new location was very jumbled and rough, which made for a bit of a bumpy snow machine ride. However, the rough ride was reassuring since it meant the ice was probably quite stable. The roughness in the ice and the formation of pressure ridges is largely due to wind moving the ice around and piling it into the shore. Eventually, with enough pressure it becomes locked in and grounded to the bottom. Once at the site we began to set-up the camp. 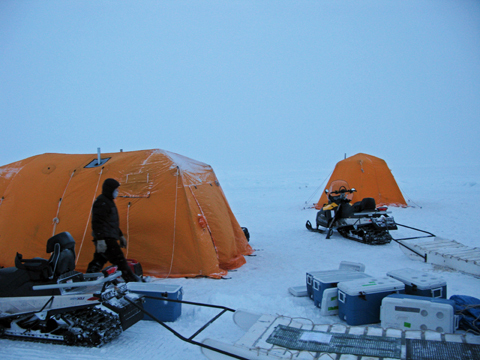 Since it was a new camp we had to drill new ice holes and situate the tents over them. 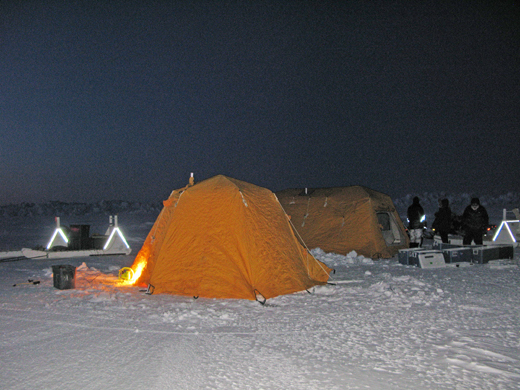 We also set-up propane heaters in each of the tents, and unloaded all our gear. 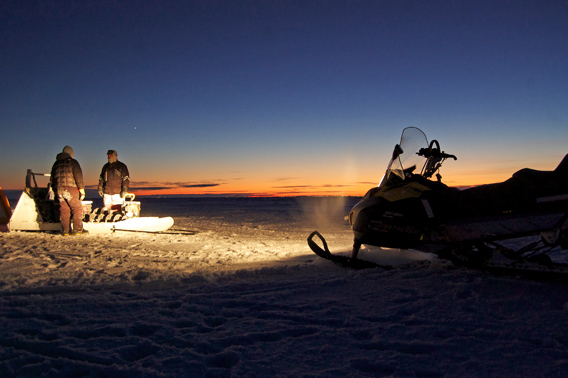 It was a cold morning but absolutely spectacular to be out on the frozen Arctic Ocean. Everything was going smoothly. First, Victoria and I deployed our Manta water quality instrument to measure the water column and then the Bronk group took over. Then disaster struck! 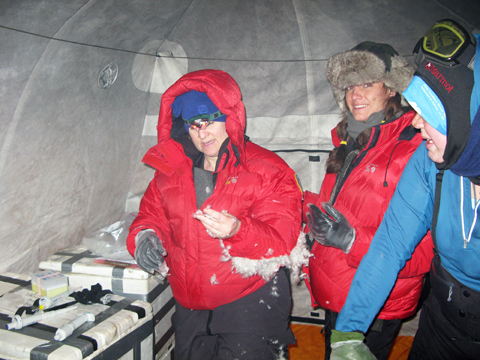 While moving one of their very heavy sample boxes Debbie’s foot slipped into the ice hole and she fell. Her hand hit the propane heater;her down coat touched the hot chimney and melted. Feathers went everywhere. Debbie screamed. It was chaos, but no one panicked. Debbie was quickly pulled to her feet and, besides a nasty burn on her hand (and the destroyed coat), she was fine. Dr. Debbie Bronk after the fall, it could have been much worse! We turned the heater off and, when the feathers settled, we were able to continue. But, we thought it best to get Debbie back home so that someone could look at her burn. 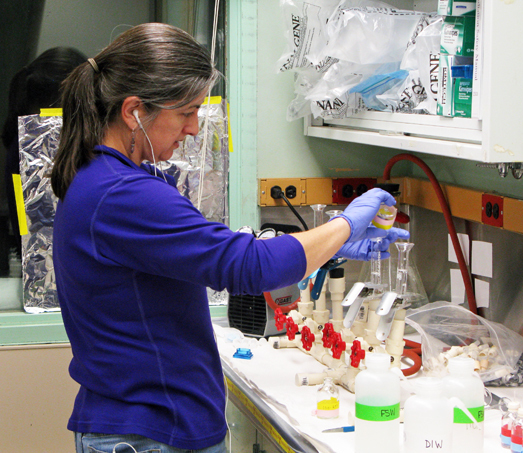 So while Debbie was escorted back, the rest of us finished-up sampling and then followed her in. 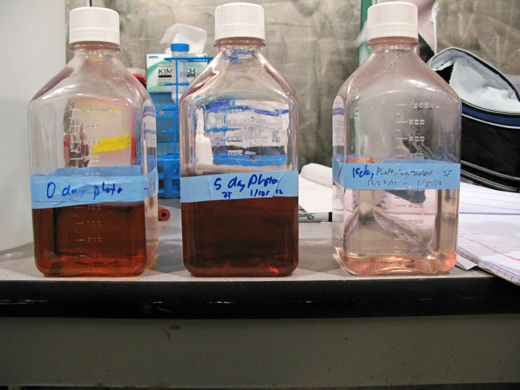 Once back we all got busy in the lab processing the precious water samples that we had collected. We all realized how lucky we all were today and grateful to be back safely. I for one slept well. Given the uncertainty of the ice conditions today was an evaluation and re-strategizing day. We began with a big meeting of all the science and logistics team members. We went over the previous day’s adventures and discussed options. Obviously we have come all this way to conduct our research, but we won’t do it if it isn’t safe. Since all of our previous sampling locations are now unavailable, we are left with the option of locating another site or not sampling at all. 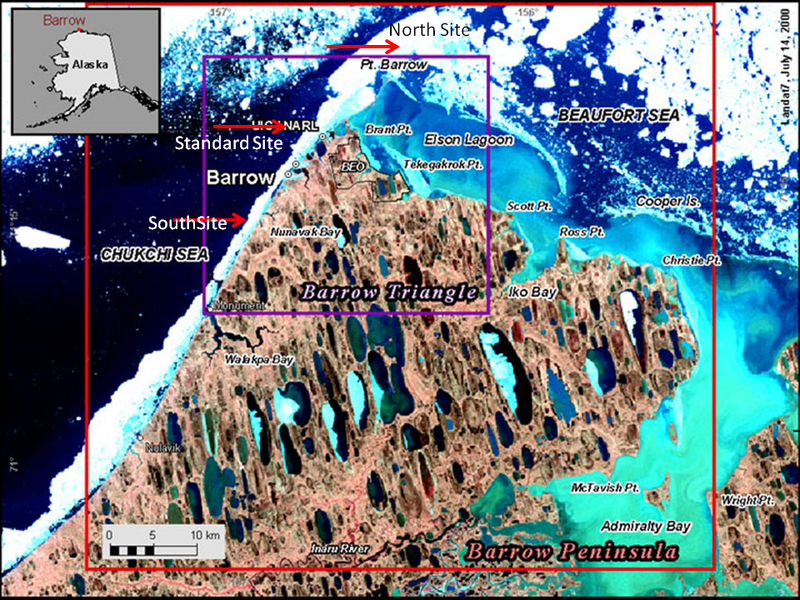 Brower suggested that further south, because of differences in oceanographic conditions (only 1 northward current) the ice might be more stable than it is where we have been sampling in the Chuckchi sea near Point Barrow. At Point Barrow three currents converge making it a much more dynamic location oceanographically. This can lead to ice instability. Our other option is to head north where, according to Brower, the ice hasn’t moved for the past several days and therefore is probably stable. The problem with that site is that it is very shallow. 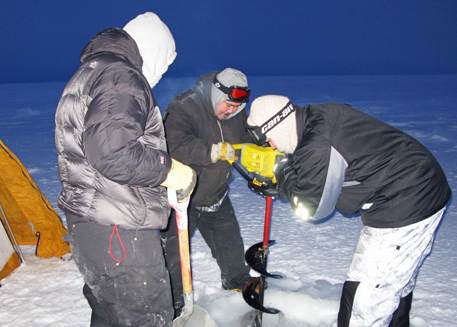 We much prefer to sample deeper water since we are trying to study water column processes representative of the Arctic Coastal Ocean, and the shallow site may be heavily influenced by processes that occur in the bottom sediments. So after the big meeting, we were again in standby mode to allow the logistic team to visit and evaluate our options. By the late afternoon it was clear that the southern deep water option was not available. The ice was clearly unstable there too. 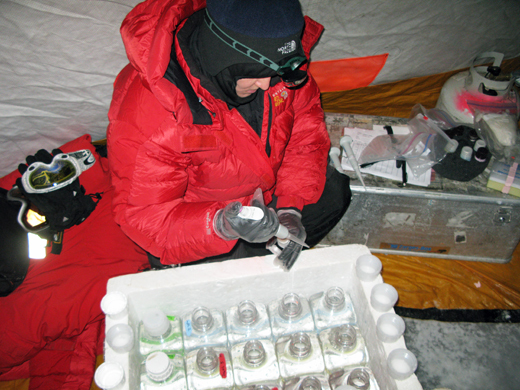 Plus, the site was far enough away that it would have been difficult to stage an expedition and get our samples back to the lab without them freezing on the trip home. After verifying that the Northern site was safe it was decided that that is where we’d go. 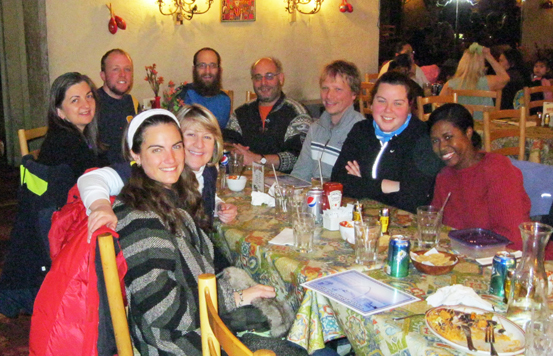 Since it was a light day and everyone was done reasonably early we all decided to go out to dinner. We went to Pepe’s North of the Border, a Barrow favorite. Pepe’s is a Mexican restaurant that has been in business for over 30 years run by the proprietor, Fran. 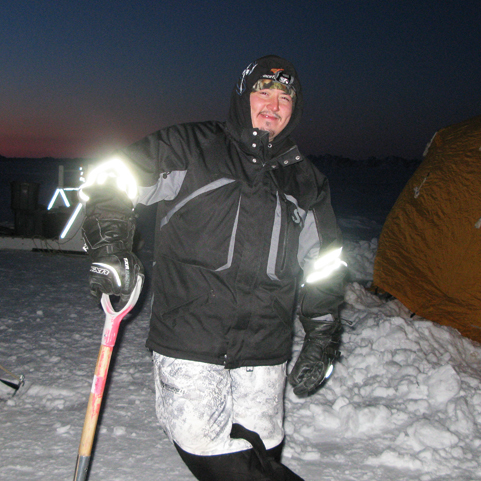 Fran was originally from Seattle and came to the North Slope over 40 years ago as pipeline engineer. She stayed, eventually settling in Barrow, and is still active at the youthful age of 82. 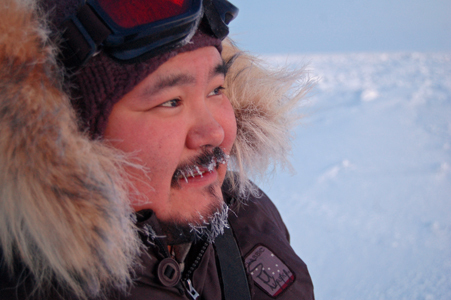 Marc Frischer continues his account of his research trip to Barrow, Alaska. This morning, we again caught a 6am flight. 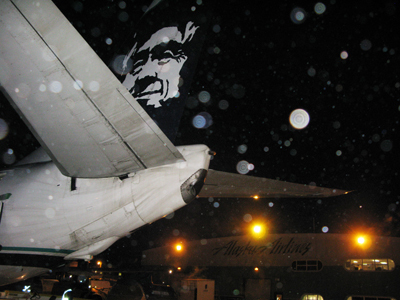 This time the flights took us to Fairbanks, Prudhoe Bay, and then into Barrow. As usual the scenery from the air was spectacular! After another 5 hours of flying we landed in Barrow. It was 11 am but it could have been 11 pm. Barrow is still experiencing 24 hours without the sun though we expect to see the sun for a few minutes when it rises for the first time since November 18 on January 23rd. We should see the sun for about 30 min that day. Although the sun isn’t above the horizon, for several hours a day there is some light as the curvature of the Earth creates a long twig light period. Because there is so much white ice and snow which is highly reflective, it’s actually quite bright given that the sun isn’t even up. After a brief meeting with the rest of the science and logistics support team to get re-oriented and check in, we immediately set out re-locating all our gear and setting-up our various laboratory and field staging spaces. We spent the rest of the day doing that but managed to find all our stuff and get it re-distributed into the right places. Tomorrow we’ll set it all up and make sure that it is all working. 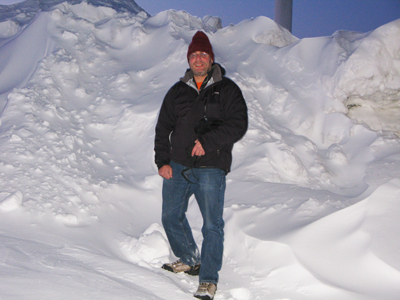 One surprise was that the facility where we do most of our water filtration (The Beach Freezer) was practically snowed in with a big drift of snow. The door was accessible though, so no problem. Tish Yager and Colin Williams from the University of Georgia (UGA), Debbie Bronk, Rachel Sipler, Steven Baer, and Jenna Spackeen from the Virginia Institute of Marine Sciences (VIMS), and myself and Victoria Baylor from the Skidaway Institute of Oceanography (SkIO). Next week are also expecting to be joined by one more member of the UGA group. 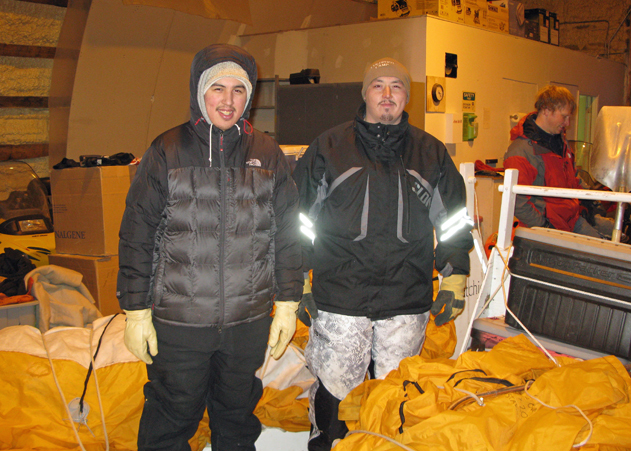 We are being assisted by a very competent and can do attitude logistics group from UMIAQ and CH2MHILL Polar Services (CPS). Without this support we absolutely couldn’t accomplish anything here. Around 5 pm we called it quits for the day and headed out to our favorite Barrow restaurant Arctic pizza for dinner, more planning and to catch-up with each other. Note: Marc Frischer and Victoria Baylor are back in Barrow, Alaska for their final research trip on their climate change project . They will be blogging about their “adventures.” In this post, March Frischer writes. It’s back to Barrow again! This will be our last trip of this project so it’s a bit bitter sweet for us. We are very excited about collecting the last of our field data and proceeding to the next phase of the project. It’s exciting to, after 3 years of hard work collecting samples and data, to finally be in a position to analyze it. 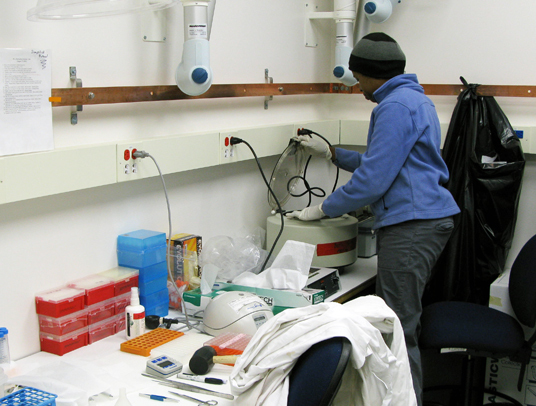 We should have enough data now to address our main questions about microbial processes and the potential change that may occur in the Arctic as the permafrost melts and releases all of the organic material that has been stored there for thousands of years. On the other hand we’re going to miss the excitement of the trips and the raw beauty and drama of the high Arctic that we have had the opportunity to experience. As with our previous trips we have been hard at work arranging the logistics for this trip. 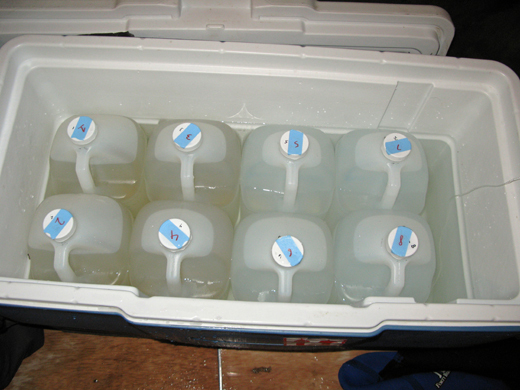 Making sure we have all our equipment and supplies in place and organizing our sampling logistics and team. A good piece of advice for anyone conducting field work in remote locations: never get ahead of your gear. 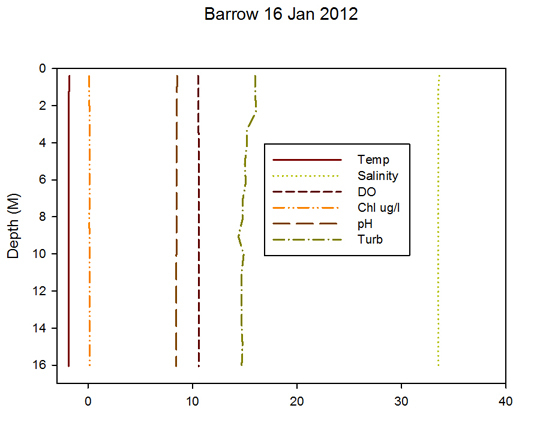 Because it is the winter (again) the challenges of working in Barrow are at their highest. We are expecting temperatures to again be well below zero ranging from -20 to -40 degrees below zero with significant wind chill. 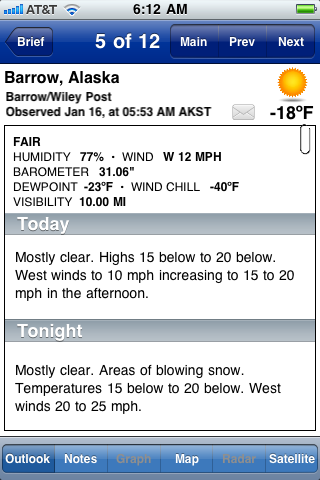 Last time we were in Barrow we experienced temperatures of -47 deg F and wind-chill approaching -70 degrees. So far the weather forecasts are a bit better than that for this trip. Another major logistic challenge for us during this trip will be organizing ourselves so that we can retrieve all our gear that has accumulated in Barrow. We are not allowed to leave anything on the NARL campus once the project is completed. Victoria and the rest of our team have been working very hard to figure out how we’re going to get all our stuff home or give away what might be useful for people in Barrow to take ownership of. We are planning on leaving a lot of basic supplies (test tubes, bottles, graduate cylinders, etc) to a local middle school science teacher, Debby Green, who’ve we’ve been working with, but that still leaves us with a lot to get home. We’re expecting to ship home on the order of a ton of gear. Travelling across the country in the winter is always a bit risky, but our trip was smooth and thankfully uneventful. Zac who regularly participates on these trips couldn’t come this time because he is about to be a father. 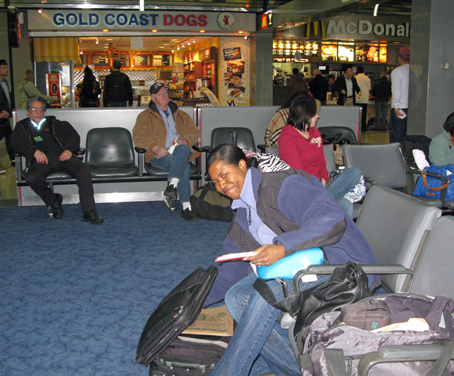 His daughter Iris is due on 4 Feb, but he volunteered to take Victoria Baylor and me to the airport for our 6 am flight. It was still dark when we got to the airport. We flew to Chicago and had plenty of time to get something to eat and check in for our next flight to Anchorage. 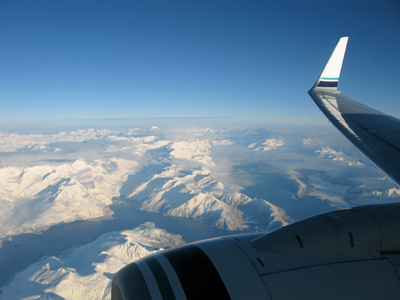 ”] We arrived 7 hours later in Anchorage, collected our bags and took the airport shuttle to the hotel where we spent the night. We’ve stayed there several times over the past years so the place is familiar and comfortable. We’ve found that it is really helpful to get a good night of sleep before starting one of these trips. This picture is for my son David. One of his favorite superheroes is Wolverine from X-Men. 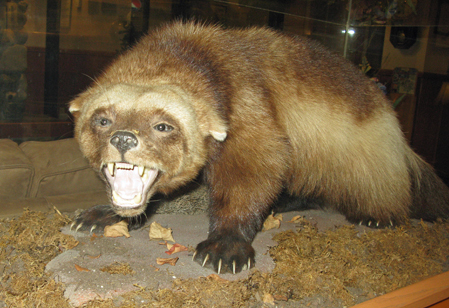 This is a real Wolverine David. After checking in and getting settled (Victoria had to run an errand. ), we went to a nearby restaurant Gwinnee’s for dinner. Gwinnee’s is a kind of an Alaskan Cracker Barrel, but it’s not a chain. 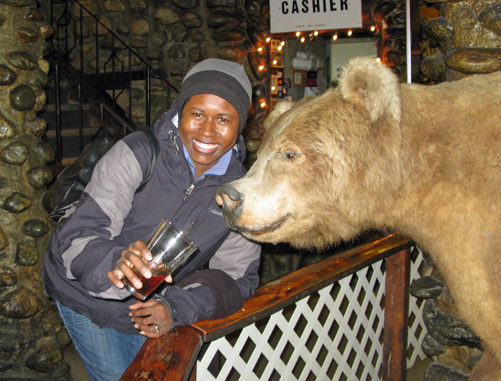 Victoria doesn’t drink but she took the opportunity to serve the bear a beer. I guess she figured that it must be thirsty. Clark Alexander’s project on erosion on the Intracoastal Waterway generated some good news coverage. 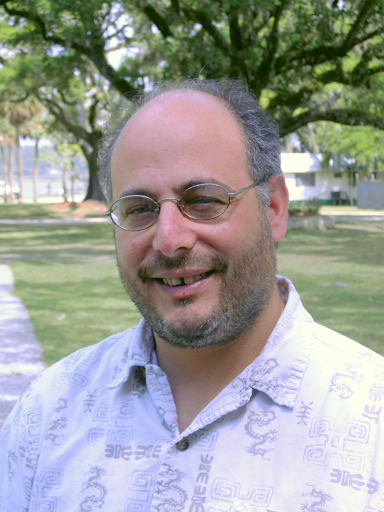 Mary Landers from the Savannah Morning News wrote this story that was published last week. Alice Massimi, from WSAV-TV (local NBC affiliate), shot this story before Christmas, but it aired yesterday.